As you can see, the non-static and local variables far outperform the static variables. If you’re going to be doing a lot of variable access, you should definitely consider caching that variable as a non-static field or local variable. Spot a bug? Have a tip? Post a comment! Static members that is part of the instance class could perform different, maybe. be interesting to see what results you get for that. Thanks for elaborating on the test. This really shows that the static lookup is the slow part, not the actual static. I suppose a better way to put it would be “use fewer static lookups”. Thanks again for the testing and the results! Thanks Jackson. And thanks ben_w, it is a bit more complete with your figures! Very interesting that PI is faster than StaticTest.PI, ben. I would had thought the opposite is true. In all test runs Own Static (PI) was the fastest among the static accessed. Could you benchmark the speed of setting context3D’s vertex buffer/constants/texture, and drawTriangles? I’m into making a 3D engine, and I have it all working ( so far ), but I want to optimize it, and I’m not sure how I would do that. I want to know which is faster, so I know which order so draw the objects. That way I can sort them, and reduce the amount of times I have to set textures, or vertex buffers. Is it faster to sort the 3D objects by texture, and then sort by geometry, or the other way around? In general, changing the 3D state (e.g. textures) is a big performance hit because it interrupts the GPU’s pipelining. Ideally, you want to do multiple drawTriangles calls without changing anything. So you’re on the right track: group your draws such that you don’t have to change state between them. For example, if you have 10 enemy models to draw, draw all of them at once since they share the same texture, vertex buffers, and index buffers rather than drawing five of them, drawing the player, drawing the remaining five enemies, and then drawing the terrain. I will add this to my list of articles to write and go more in depth on it then. Thanks for the idea. Can’t wait to see a more in depth explanation! the local is slow than the non-static.Why? Glad to hear you’re coming to the same conclusions that I did. Also, very nice tip about the singleton: it’s definitely a way to reduce static accesses. While reviewing my compiled code to see what MXMLC is doing to it (to avoid performance pitfalls), I noticed that ClassName.staticVar results in a getlex for the class, then getproperty for the ..property. staticVar results in a single getlex for the class, and the property. The real killer here would appear to not be static access, but dynamic access. The simplest way to test the assumption would be to compare ClassName.staticVar vs. ClassName["staticVar"]. If this is the case, then Adobe can improve performance of SWFs rather dramatically by making the compiler generate a single getlex for static properties, regardless of staticVar or ClassName.staticVar. Interestingly, properties of superclasses also generate a getlex instruction unless you type this. in front of them. this.prop = ... results in getlocal0, ..., setproperty while prop = ... results in ..., initproperty. initproperty has much less code on Flash Player’s side, and could potentially result in faster code. It’s just these kinds of compiler issues that I’d love to cover. Thanks for the tips! I would say “less valid”. 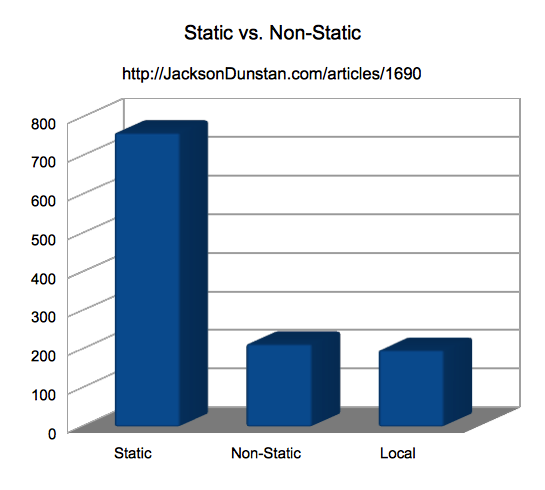 Static is still slower than non-static or local. It’s just not as slow as it used to be.